The main fascia sign is made from aluminium powder coated black to match the new window surround. 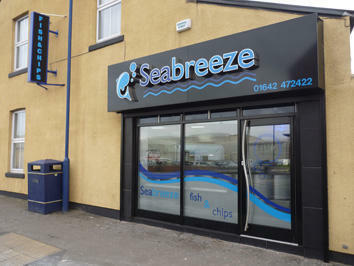 The text 'Seabreeze' and the fish logo is made from polished stainless steel with coloured acrylic faces, the lighting is provided by internal LEDs which are extremely efficient and have reduced the running cost considerably. To carry the look inside the shop the menu system is also made from aluminium and powder coated black. The menu items are printed onto the toughened glass panels which are mounted in front of illuminated acrylic panels making it highly visible and easy to read. New menus can be printed and applied as often as required. Again the illumination is provided by high efficiency LEDs so the running costs are significantly lower. An advertising feature is the centrally mounted monitor which allows for full colour menu items along with promotional slides to be displayed from a simple memory pen. The very eye catching 'aquarium' is a high resolution graphic printed onto toughened glass mounted into a brushed stainless steel frame to match the finish on the other stainless steel fitting throughout the premises. And, yes, the internal lighting was LEDs again, further pushing down the running costs.This case study illustrates what can be acheived when you couple good knowledgehighlights what can be achieved when attention is paid to the customers requirement fine detail and from a thorough knowledge to detail that we are capable of achieving giving you.